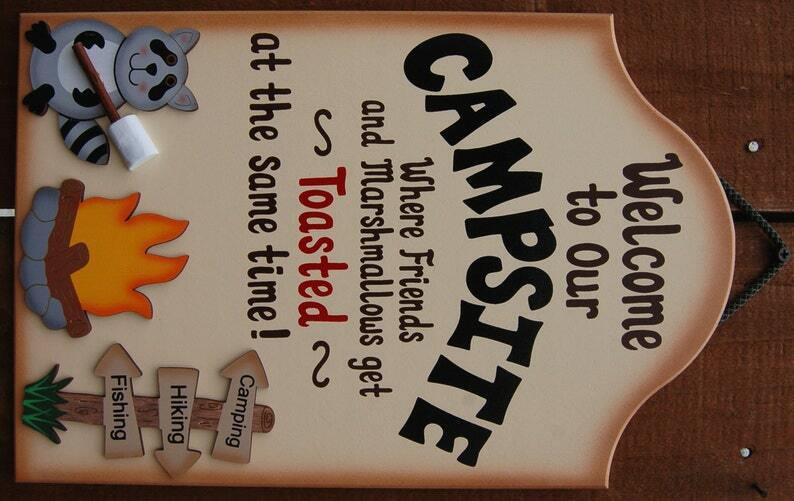 This camping sign is our newest and most popular camping sign. Do you and your friends get toasted at the same time as the marshmallows get toasted? If so, your friends and family will get some good laughs from this camping sign. Sign is made from wood and hand painted with a cream color exterior paint. Letters are painted black, brown and red. Fire, raccoon and camping arrow signs are all separate piece of wood which is attached to camping sign. It is finished with a brown shaded edge around the outside, which creates a unique finish. The handmade camping sign is completely weather proof. Because the handmade and hand painted wood camper signs are done with exterior house paint, they also hold up incredibly well to sun, wind and rain and will not fade for years.